Find out what makes stately, spacious Tudor homes so desirable—and what it takes to restore one to its original glory. If you grew up in an American suburb, you’re probably familiar with the Tudor architectural style, typified by homes with a stucco exterior accented with dark brown trim and topped with a steeply pitched gabled roof. 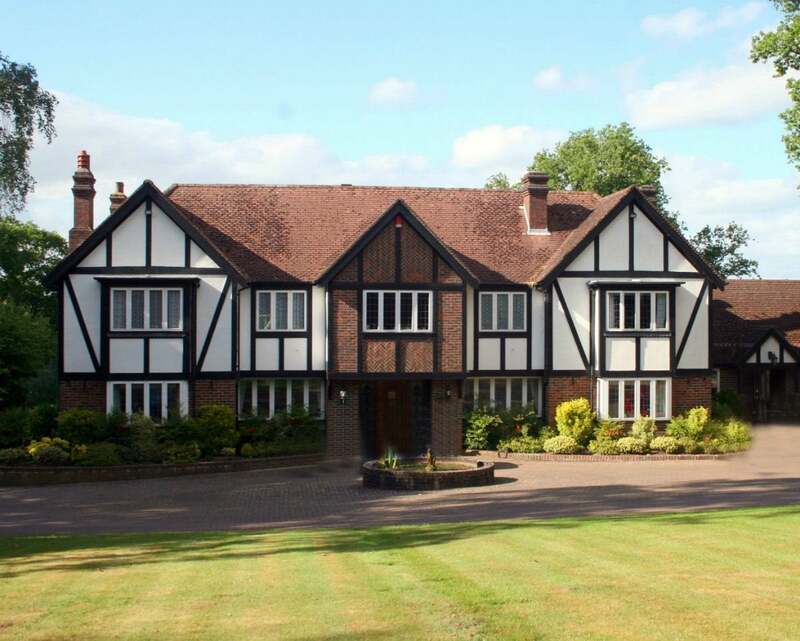 What you may not know, however, is that, charming as they are, those 20th-century homes are simply “mock” Tudors, or Tudor Revivals, inspired by timber-framed cottages built 400 to 500 years earlier, during the reign of the Tudor dynasty in England. Indeed, tens of thousands of stately Tudor style homes—immediately recognizable for their large size, steeply pitched roofs, and half-timbered exterior—were constructed in the United States from around 1900 to 1940. Their distinct attributes make them among the most easily identifiable residential styles and, because they were built to last, many are still around, having a significant impact on our communities. If you’re looking to buy one of these large, rambling homes or are simply intrigued by their architectural qualities, follow along. We’ll fill you in on the origin and evolution of Tudor houses and offer sound advice about what’s involved with owning and maintaining one of these Old World-style beauties. The original Tudor style arose in England in the late 15th Century and lasted until the early 16th Century, coinciding with the reign of British monarchs (including Henry VIII) who hailed from the House of Tudor (royals of Welsh origin). 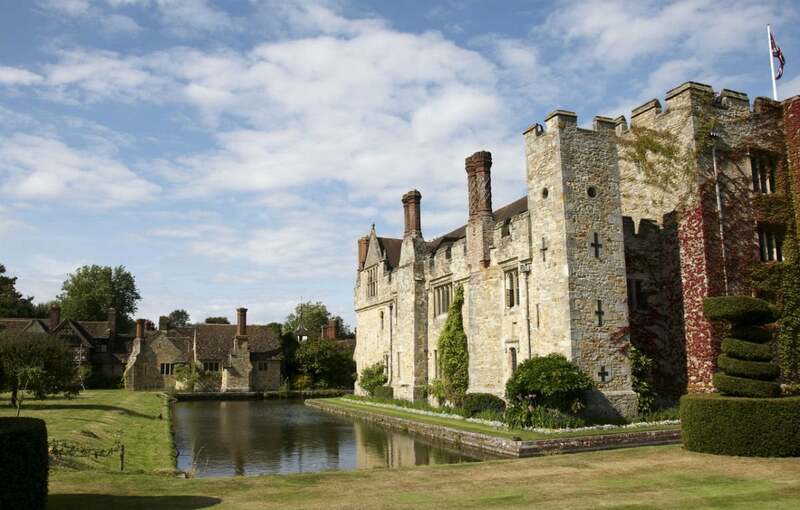 The gentry of that post-medieval period built impressive brick or stone manor homes replete with hundreds of casement windows and ornate chimney stacks, as depicted above in the additions made in the 15th Century at Hever Castle. Meanwhile, the commoners developed a more modest architectural style. Back then, an ordinary village home or farmhouse was first framed entirely of timber. The builder would then insert woven sticks known as wattle between the timbers. Using daub (a mixture of clay, sand, and dung), he would infill the spaces around the wattle and seal the wall to create walls nearly as hard as concrete. Once the wall was dry, the daub was often painted white with limewash and the structural timbers were sealed with tar to protect them from rot. This building technique, known as half-timber, allowed the timbers to be visible from both inside and outside the home and created the familiar brown-and-white exteriors we associate with Tudor-style homes today. In a variation on this construction method, the more well-to-do commoners often integrated sections of brick between timbers and added windows made up of small panes of glass held together by metal or wood. By the 16th century, fireplaces with chimneys became commonplace in ordinary homes, and the interiors consequently became more complex. Rather than relying on one large room with a central fire pit for heat and cooking, Tudor homes could now have multiple rooms that served different purposes, each with its own fireplace as a heat source. Often, large fireplaces included inglenooks where people could sit to keep warm. And now that smoke could be channeled out through chimneys rather than up through a hole in the roof, these structures could include second stories, and with them staircases made of hand-hewn timbers. These upper-story rooms—usually bed chambers—generally had ceilings with exposed beams. Old English Tudor architecture featured tall, multi-paned windows, slender columns, and towering spires, and stone chimneys that stretched far above the roof of the house. 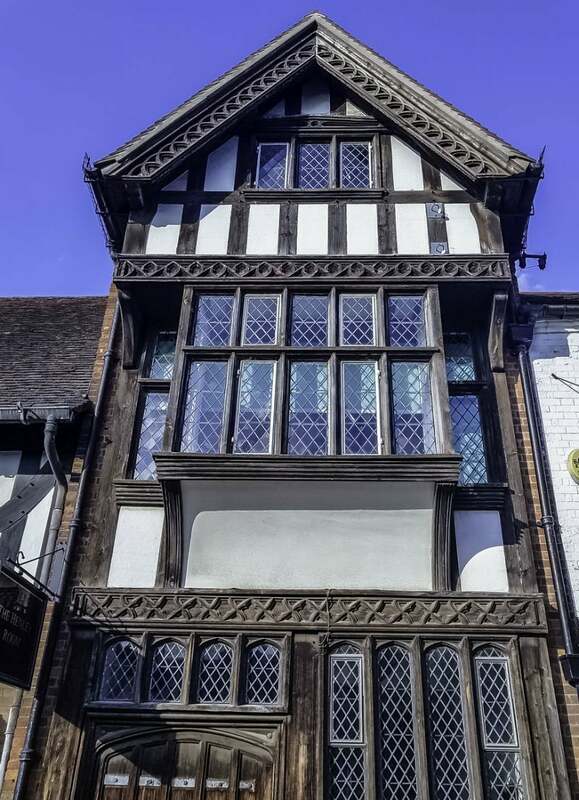 The style was grand and impressive, but harvesting the massive timbers required to build the frame of the house was laborious and time-consuming, and by the mid-16th Century, the original Tudor style was already beginning to fade in England. 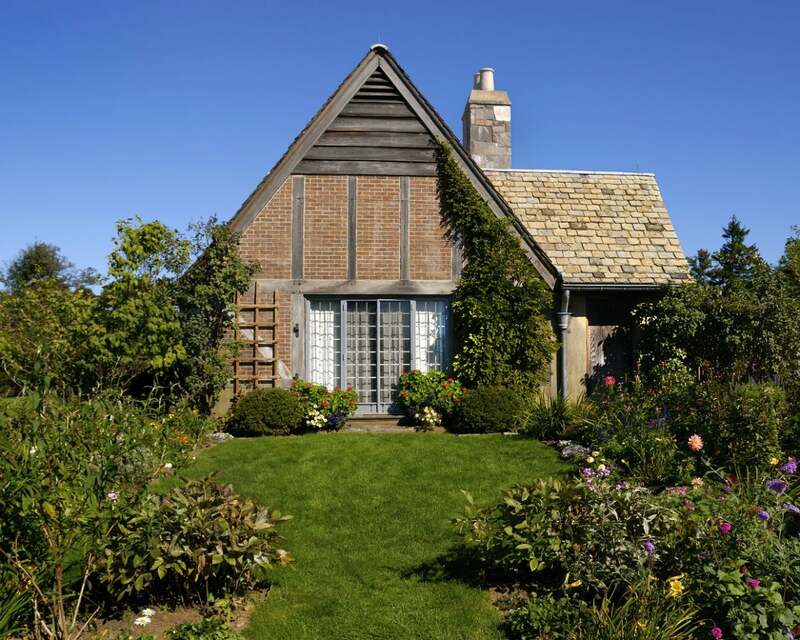 Largely forgotten for three centuries, the Tudor style reappeared in the United States in the early 1900s but built using the same wood-framing methods used to construct other homes of the era—no heavy timbers required. Americans embraced the Tudor style, building new homes that blended some of the old-world design elements with modern home-building techniques. Cousins of the Stick-style house, Tudor Revivals eschewed authentic half-timber construction and often featured brick or stone walls on the first story, and upper floors that were stud-framed and covered with a veneer of stucco and decorative faux timbers. Cross gables were commonly included in the plans, as were typically Tudor features like steep rooflines and gabled windows with leaded-glass mullions. The traditional thatched roof, however, was replaced by slate. Interiors incorporated such Tudor-style elements as decorative beamed ceilings, arched doorways, plaster walls, and detailed wooden staircases. 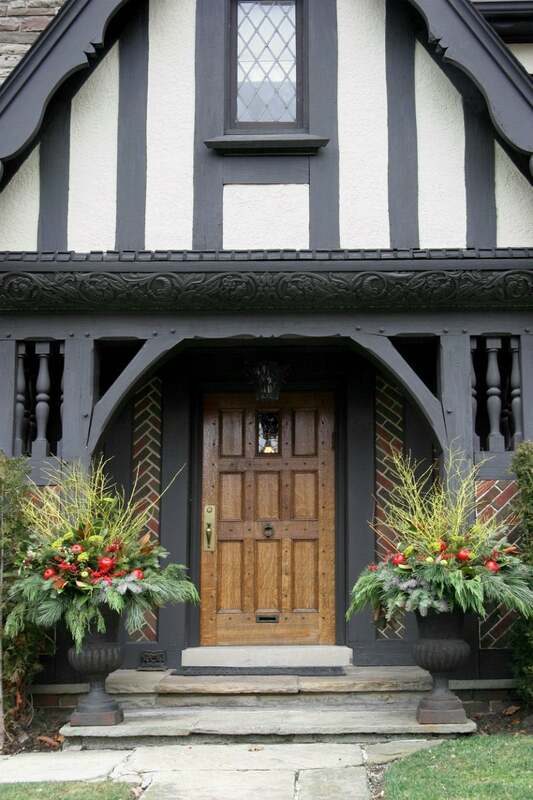 These Tudor Revival homes, also known as “Mock Tudor” and “Jacobean” (after King James of Scotland), use strips of boards, interspersed with stucco or masonry cladding, on the exterior to mimic the historical half-timbering effect. 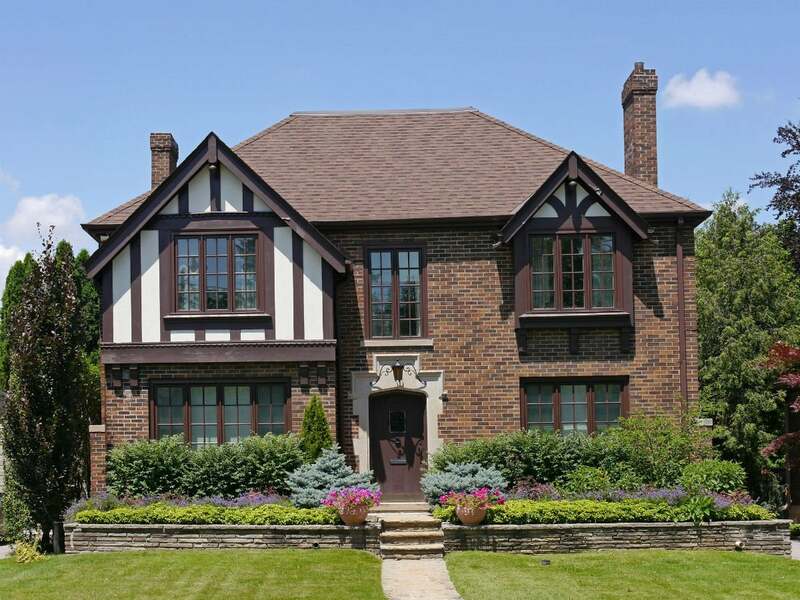 Tudor Revival popularity reached its peak in the 1920s but gradually declined as the Great Depression swept the nation. By the time WWII arrived, Tudor Revival construction was all but over, having been replaced by smaller, more modest homes. Steeply pitched roofs and multiple gables. Two or three stories high. Half-timbered exterior façade used in conjunction with stucco or decorative brickwork. Cantilevered (overhanging) second story extending over a large porch. Tall windows with multiple square- or diamond-shaped panes; some are leaded glass. Chunky iron door ware that lends a Medieval look. Earth-tone cladding colors (tan, brown, buff). Interiors with (faux) exposed ceiling beams overhead. Oversized, stained wood detailing, including wainscoting and trim. One and a half stories with a square or rectangular floor plan. Steep roof angles, some with roof lines that extend within just a few feet of the ground. A single tall ornamental chimney. Brick or stone siding with a decorative half-timbered façade above the first story. Tall windows with multiple panes. During their peak of popularity, most of the large Tudor houses were built in the Northeast and the Midwest. Many have been restored, and you’ll find them in historical districts, alongside other grand house styles of their day, including Queen Anne and Victorian. Small Tudor cottages can be found in the same communities, but many of the existing ones have been updated with new cladding, which covers the original decorative half-timbering, making it more difficult to identify the original style. While grand Tudor Revival homes exist in many communities, the most well-known examples of this architectural style are commercial rather than residential. 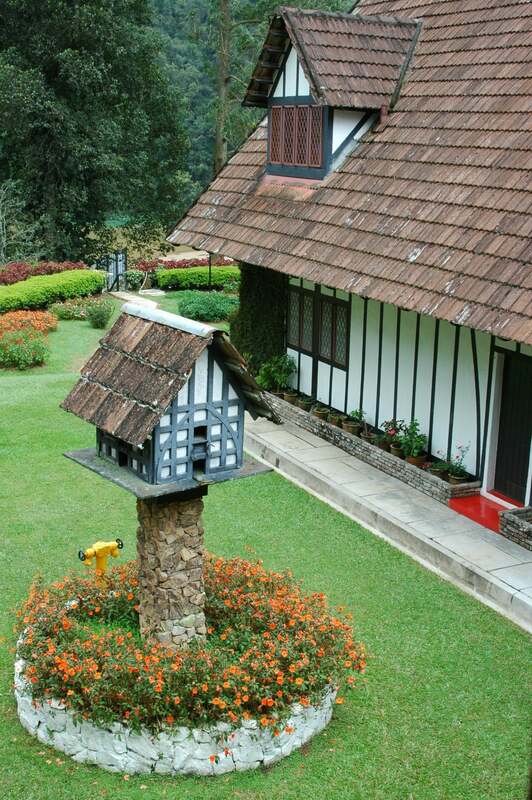 The following buildings have been beautifully maintained. Erected in 1890 and one of the first Tudor Revival buildings to be constructed in the US, the Adams Building, located in Quincy, Massachusetts, is one of the best-known examples of Tudor design. The building housed merchants on its ground floor while providing residential apartments on the upper floors. Built by John Quincy Adams II, grandson of President John Quincy Adams, the structure was so massive it had to be constructed in two stages. The Adams Building features the hallmarks of Tudor style, including decorative half-timbering, a steep roofline with multiple gables, and tall ornate chimneys. 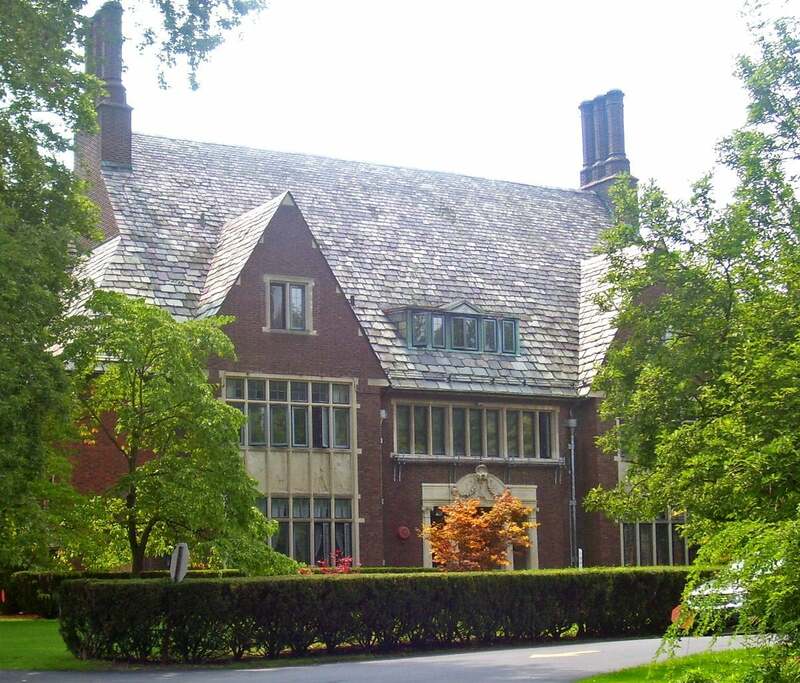 Built by New York businessman and philanthropist Vincent Astor in 1914, the large manor was designed to accommodate children who were recovering from illness. The Astor House (also called the “Little Red Schoolhouse”) sits on a large 18-acre estate in Rhinebeck, New York, has been carefully restored over the decades, staying true to detail, and earning itself a spot on the National Register of Historic Places. It features a distinctive high-pitch roof, with ornate chimneys that rise tall above the peak. Its brick façade and impressive tall windows are visible hallmarks of Tudor Revival architecture. Tudor Revivals continue to be a popular architectural choice today, especially for homeowners seeking a historic aesthetic. Many large Tudor houses have already been restored, and if you’re in the market for a turn-key Tudor, you could pay $1 million or more, depending on location. But Tudors in need of serious TLC can be had at a bargain basement price of less than $100,000, depending on location and the state of disrepair. Keep in mind, however, that remodeling a large Tudor home is cost-prohibitive for many (even if you’re a DIY guru). Even when it’s finished, its unique design will present maintenance and upkeep issues due to some of their most compelling elements, namely slate roofs, plaster walls, and highly inefficient leaded-glass windows. If original, decorative half-timber boards may need replacement. It’s likely they’ve decayed or rotted over the years. Advances in building techniques and materials have led some homeowners to turn to synthetic wood and stucco substitutes when updating a half-timber structure and to replace the interior plaster walls with drywall. Brick cladding may need repointing. This time-consuming repair process involves grinding away and replacing the mortar in the joints. Interior wood may require stripping and refinishing, especially if it’s been painted. Tudor houses may require an electrician to ensure that the wiring is up-to-date. Many Tudor houses were updated in the 1950s and were rewired at that time, but unless the wiring has been updated again within the last 20 years, it may not be sufficient to run modern appliances. Window replacements would be expensive but necessary for energy savings. The many windows in a Tudor house reduce the overall energy efficiency. Replacing old casement windows with new high-efficiency models will help, but expect to pay $500 to $1,500 for custom-made windows (old windows are rarely standard sizes). Expect utilities to be more expensive for this historical home style. Even when your Tudor house is completely remodeled, be prepared to pay higher-than-typical utility bills because these homes often have upwards of 10,000 square feet of living space to heat and cool. Regularly inspect the roof for leaks. Roof maintenance is often an issue in Tudor houses due to multiple intersecting roof lines (a prime spot for leaks). Because the roofs are steep, you could pay $30,000 to $60,000 to have the roof professionally replaced. If you long for the Tudor look but aren’t ready to tackle a restoration project and your budget prohibits the purchase of a fully restored home, consider incorporating elements of the style in a newly constructed home. While the Tudor style is no longer a construction trend, you can find blueprints of homes with Tudor style exteriors or work with an architect to help you design your Tudor dream home. You could pay anywhere from $50 to $115 per square foot more than the going square foot rate for residential construction in your community, because the architectural elements that create a Tudor look require custom construction. Decorative half-timbering (usually upper stories). One or more tall chimneys. Stone, stucco, or brick cladding between half-timber boards. Neutral color pallet (browns, tans, white and cream). Cantilevered (extended) portion of the second story (often over the main entry). Tall windows with multiple panes (diamond-shaped leaded glass is traditional). Interior stained wood trim, such as wainscoting, built-in cabinets and bookcases, and decorative wood paneling. Overhead wood beams (can be faux). Opt for brick or cobblestone sidewalks and a driveway to complement the look. With additional reporting from Jennifer Stahlkrantz.